Born April 27, 1932 in Toronto of Ukrainian immigrant parents, Steven Staryk began his violin studies at the age of seven. The publication of his career memoirs and observations in Fiddling With Life has been lauded by reviewers and distinguished musicians. His prodigious career was a unique and extraordinary integration of related activities: soloist, pedagogue, chamber musician and concertmaster; he surpassed the summit in each and every role. The title “King of Concertmasters” was bestowed upon him by The Strad magazine after having led three major orchestras by the age of 35: the Royal Philharmonic, the Royal Concertgebouw (the first British subject to attain a major position in continental Europe) and the Chicago Symphony. He also served as Concertmaster of the Toronto Symphony Orchestra, the CBC Symphony and the Boyd Neel Orchestra. 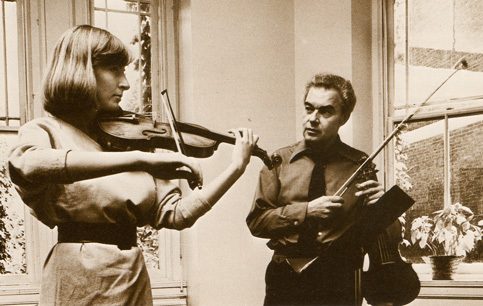 Staryk taught at several of the foremost music schools including the Amsterdam Conservatory, Oberlin Conservatory (the youngest full professor in the institution’s history), Northwestern University (Chicago) and Toronto’s Royal Conservatory, culminating in his receiving the Distinguished Teaching Award (the first ever awarded to a professor in the University of Washington’s School of Music). The first faculty member in the history of the music school at the University of Washington to receive the Distinguished Teaching Award. In this photo Staryk is at the Royal Conservatory of Music in Toronto where he received an Honorary Fellowship. Steven Staryk was the first Canadian invited to serve on the Jury of the Tchaikovsky International Competition in Moscow. His memorable performances and recordings illustrate an amazing wealth of musical knowledge. 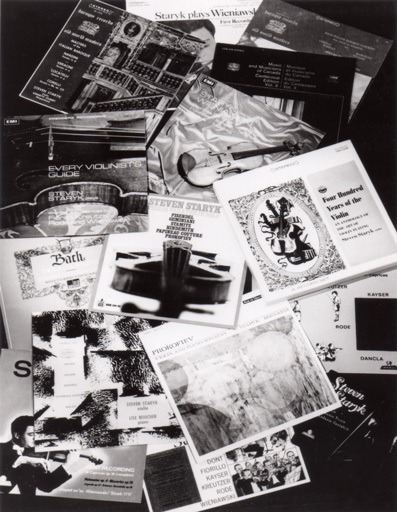 These have secured him international awards and distinctions, as listed in 23 publications including The New Grove Dictionary of Music and Musicians, The Great Violinists, Wikipedia, etc. Other awards include the coveted Shevchenko medal, the Queen’s Silver Jubilee and Diamond Jubilee Medals, Honorary Doctorate of Letters from Toronto’s York University, Arts Awards from the Canada Council, an Honorary Fellowship from the Glenn Gould School of Toronto’s Royal Conservatory of Music and Officer of the Order of Canada. A sample of the numerous Staryk recordings released. 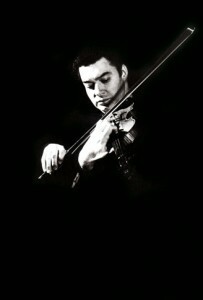 His successful diversity of styles is not equalled by any other violinist. He gained a tremendous reputation and vast musical experience with such greats of our time as Beecham, Szell, Krips, Kubelik, Jochum, Kempe, Giulini, Sanderling, Rilling, Rodzinski, and a host of others. In this respect his musicianship was greatly influenced by non-violinists and developed far beyond the limitation of his instrument. The extraordinary accomplishments of this internationally-respected cosmopolitan remain unparalleled in the history of music. 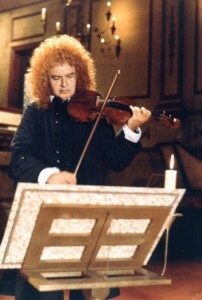 Staryk playing the role of Vivaldi in the 1987 docu-drama. "Why it took so long for Staryk to reach earth will always remain a mystery."